Can You Remember Where You Were...? ...Has it really been three years already? I remember it well. I was teaching RE in a Catholic School and had been talking about the Conclave all day. At lunchtime, Fr. 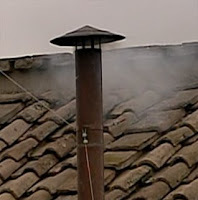 James Clark (our priest chaplain) had popped into the staffroom, and we tried to see what was happening on various internet sites: there was a bit of a scare when the report of "white smoke" was mentioned, but it soon became clear that the smoke was a definite black. After school I drove back to the parish club... I didn't have cable or satellite TV, and Fr. 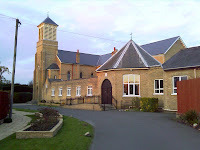 Tim had said that, as nothing was booked for the evening, I could go in and watch the TV there for a bit... he was at the seminary at Wonersh, I think, but the parish secretary gave me the key to the hall. I was pretty sure nothing would happen for a while, but it was a luxury to be able to hear what the different TV stations had to say about the whole process... so I arranged my books for marking, turned on the TV and went to the kitchen to make a cup of tea. As I was fishing out the teabag, I heard the announcer state that black smoke had gone up. I was disappointed, but not terribly surprised, and I decided that I'd just drink my tea, do some marking with the news in the background and then go home. A group of people suddenly appeared - they had assumed that the hall would be empty, and they wanted to set up the tables for refreshments after a funeral on the next day... did I mind? I explained that I was just watching the TV, so I didn't mind, as long as I wasn't in their way. 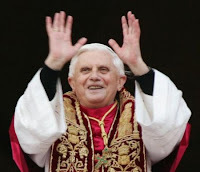 I had jokingly said that it would be great if Cardinal Ratzinger was elected, but had been told firmly that this just wasn't possible, though he might turn out to be influential as "kingmaker." That wily old Cardinal Estevez was milking it for all it was worth... but when I heard "Josephum" I screamed and jumped up and down... I didn't know that there was another Cardinal called Joseph, but the "Ratzinger" which followed after the pause confirmed it. Phone calls and furious texting to friends ensued. The other people in the hall seemed a little bemused by my behaviour. "Errm... it's good news then?" "Very good indeed!" was my delighted response. ...Should a return from retreat be known as an advance?? With the school "Easter" holiday (sorry, "Spring Break") so late this year in relation to the Easter festivities, I decided that it was a good time to make a retreat. Nothing formal, no set programme, just me. I considered Aylesford, but it can be a little busy in the holidays (with day visitors who just turn up for a chance to visit the beautiful grounds) and I thought I could do with some "serious" prayer time. A friend of mine had joined the Abbey of St. Cecilia six and a half years ago, and I'd been meaning to pay her a visit for ages... that, combined with the idea of an enclosed convent where the nuns chanted the Office in Latin, seemed to be just the ticket. 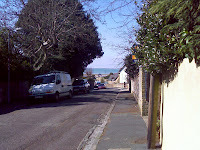 I made the decision to leave the car at home - partly because the ferry fares to the Isle of Wight are exorbitant (making the stretch of water between the island and the mainland the most expensive anywhere in the UK) and partly because it provided a perfect opportunity to get my car serviced and MOT'd. 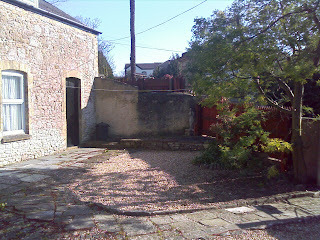 Guests usually stay in The Garth, a small cottage next to the Abbey. There is another house, The Hermitage, but this is reserved for visiting priests and religious. 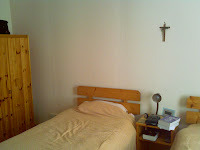 My room, on the ground floor, was spacious and comfortable, though Sister Claire, (the Guest-Mistress) assured me that it was the smallest of the rooms. 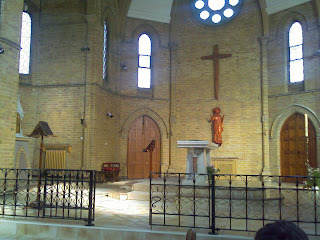 The first time I visited the Abbey church was for Vespers. 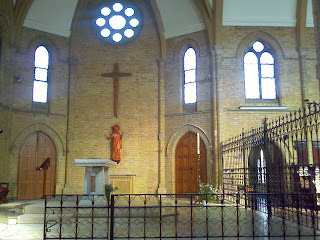 The view from the laity's side of the church was pretty uninspiring: a bare marble altar in the middle of the Sanctuary, and on the "back" wall there is a cross (not a crucifix) with the word "Pax" carved in the centre, and a statue of St. Cecilia just below it. 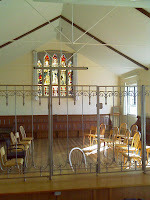 The Tabernacle, obviously bang in the centre as far as the Community is concerned (which is absolutely as it should be), is actually quite difficult to see from the laity's side: it is set into a recess which obscures the Tabernacle from view. I enjoyed Vespers, and, later on, Compline - I was able to follow the psalms in a little booklet which gave the Latin texts and their English translations, but didn't attempt to sing along. The chanting was beautiful, and made all the more ethereal because the nuns were not visible from the pews on the laity's side of the church. My indication to the elderly Sister at the door that I wished to attend Lauds was greeted with consternation: apparently several books would be needed, and it would prove complicated to follow. I promised to bring my own Office and pray that instead, which reassured her, and she told me that the door would be opened just before Lauds at about 6:50am. In fact this proved to be very agreeable: because chanting takes so much longer than simply saying the words, and because there are more psalms prayed in each of the Benedictine Offices, I was able to pray the Office of Readings and Lauds together, and then sit and listen to the remainder of Lauds chanted by the sisters as I prayed quietly. This is something I would not have been comfortable with prior to attending the Extraordinary Form; I would have felt "lost" without following every word. As well as a short time for discussion with the Guest-Mistress each morning after Mass, I was also able to meet up with my friend, Sr. Madeleine. Her own sister (and family) were also visiting, so we had a little reunion in the parlour. 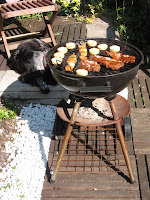 I was delighted to see that the grill wasn't quite as ferocious as the types shown in old films! It is quite dreadful to think that contemplative orders such as the Sisters at St. Cecilia's may soon lose charitable status in this country, because they are deemed by the State not to provide any public benefit or service. On the contrary: the ceaseless worship of God on our behalf and the prayers of intercession for the needs of the world are the greatest possible benefit to our society, and we need to pray that more young people will make this supreme sacrifice and answer Our Lord's call. There are, apparently, no instances of "cussing" on my blog. I should ###### well hope not! 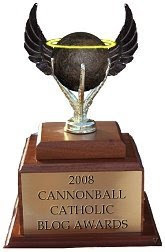 With only 12 hours to go in the 2008 Cannonball Awards, I see that Fr. Richtsteig of Orthometer has surged ahead in the best Church Militant blog category. Now this is most definitely not on. Orthometer is up for lots and lots of awards, so feel free to vote for his excellent blog IN THE OTHER CATEGORIES. Best Church Militant blog award has MY name written on it. And I've prepared my acceptance speech. So go back and CHANGE YOUR VOTE accordingly. After Mass this morning, a young woman was looking for Fr. Tim, as she needed something translated from Latin to English. Unfortunately, Fr. Tim is away in Rome. A parishioner decided that I might actually know a little Latin myself, and so I was approached. 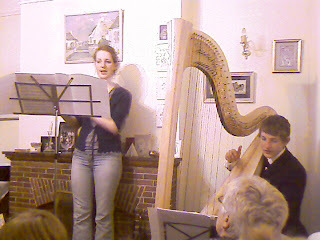 Luckily, the young woman wanted the words to Pie Jesu, which is pretty easy, even for a duffer like me. But in the new series of Britain's Got Talent, Andrew Johnston sang the first part of the Pie Jesu, completely wowing the judges (including the normally acerbic Simon Cowell) at the tender age of 13 ! Whoops! Not that sort of Barbie, apparently!! The Sisters of the Gospel of Life are running an appeal. At the moment they have lots of Barbie and Action Man dolls which need clothes before they can be given to the older children of the families the Sisters sometimes help. There are a few requirements: the clothing for the Barbie dolls needs to be suitably modest. We're not talking nuns' habits (though you never know!) but none of the really tarty stuff. And the clothing for the Action Man figures needs to be non-military... many of the children are refugees, and have had unpleasant experiences with various militia. Wow. There's a website which can convert your computer monitor into a camera. So now you can take your own photo and post it on the web. Ukok first alerted me to this amazing breakthrough. You can check it out for yourself HERE. Great minds, and all that... I was pondering this very thing at Mass this morning. "You can tell a good priest by how he cares for the fragments." ..."There is just so much to love in the Mass, but there is a special joy for me to watch a priest take the time and care when purifying the sacred vessels. 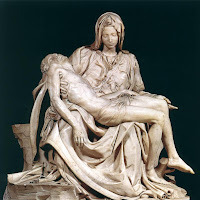 When I watch a couple of priests that I know it seems to me that when they are doing this that it reminds me so much of Michelangelo's Pieta with Mary holding Jesus. There is such evident love and care in performing this seeming mundane action that it all the more brings to me the reality of Jesus being sacramentally present in the Holy Eucharist. The attention to detail to ensure that even the smallest fragment of Our Lord is treated with the reverence and worship our Lord deserves can say more than a dozen homilies on the Eucharist." Twitch of the mantilla to the great Curt Jester, in one of his more reflective moments! 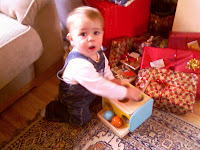 I went down to see my sister on Friday. It was lovely to catch up. We met a friend of hers (with her baby) for coffee in a local coffee shop, and it was interesting to observe other people's reactions to the appearance of children: one young woman seemed to get rather huffy because there was noise, and made a big thing of rustling her papers and finishing off her coffee before stalking out. It's true, she really did "stalk" - there was irritation oozing from every pore. And yet my nephew was in his pram, and wasn't making much noise... and the other toddler was toddling harmlessly around (followed by his mother, he wasn't just being allowed to run around) and pointing at various objects while his mother said what they were. They weren't being disruptive, and certainly weren't screaming the place down. I suppose that, a few years ago, my reactions would have been very similar to those of the huffy woman. But, having taken private vows and getting so involved in parish events, I am fortunate enough to have had a fair bit of contact with young families (and large families too) and so I think I may have become a bit more tolerant... just a bit! I was privileged to be invited to a joint birthday party this evening as well... several families getting together to have fun. The children got together to put on a magic show, and there were charades, and birthday cake, and champagne... and two of the youngsters provided the music while the adults practised their ballroom dancing skills. Most of my photos didn't come out, as people were moving too quickly, and there didn't seem to be much point in putting up a load of blurred photos. Unfortunately, one of the photos which did come out had a friend moving her hand in such a way that she looked as if she was picking her nose. For the sake of friendship, I think I shall have to leave that one unpublished!